The name says it all!! - Browbands with Bling & Other Things! These exquisite Hairnets/Snoods are carefully hand-crafted from high quality materials rayon, crochet. 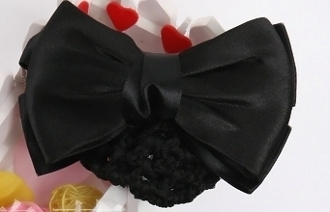 These Hair bows completes your set of matching items for a reasonable cost, icing on the cake! These elegant designs will set you apart in the show ring, or just at the barn! The Hair Bows come in (4) Different colors. Made with a rayon and crochet material. Choose fromt the following colors, Black, Brown, Burgundy or Navy! !